Carlos Rosa, Annisa Wanat, Rey Colon and Tim Meegan appeared at a joint forum to talk about social justice issues. IRVING PARK — With just days to go before Tuesday's upcoming municipal elections, aldermanic candidates in the 33rd and 35th wards continue to campaign hard for votes, appearing Thursday night at a forum focused on social justice issues. 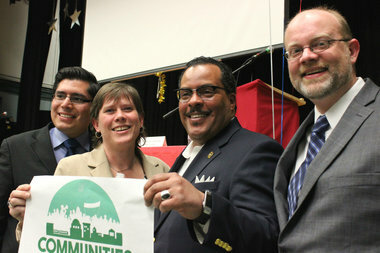 The event, hosted by Communities United, drew Tim Meegan and Annisa Wanat from the 33rd Ward and incumbent Ald. Rey Colon and challenger Carlos Rosa from the 35th Ward. Ald. Deb Mell from the 33rd was not in attendance. Following a series of testimonials from residents that touched on topics like affordable housing, education and challenges facing immigrants, the candidates fielded questions related to the individuals' experiences. Both Meegan and Wanat are being pitched as "not-Mell" candidates in a ward that's been served by a member of the Mell family since the 1970s. But sharp differences between the two challengers became apparent as they outlined their positions on subjects like participatory budgeting and an elected school board. A teacher at Roosevelt High School, Meegan strongly supports the establishment of an elected school board. "If you haven't been to a Board of Ed meeting, it's the most absolute undemocratic thing I've ever seen," said Meegan. "These people aren't accountable to anyone but the mayor." Wanat said she favors a hybrid board that would draw on representatives from Local School Councils. "There's no proof that fully-elected or fully-appointed is better," she said. "Either end of the spectrum has its pros and cons, which is why I think the hybrid is the best." Regarding participatory budgeting — engaging residents in the spending of a ward's $1 million in "menu" money — Meegan said he would solicit ideas for projects from the community and give residents a say in how those projects are then prioritized. "We need more democratic decision-making in the ward," he said. Wanat said that while it's "important that people have a say," participatory budgeting in its purest from isn't necessarily the best method. Instead, she said she would create a revitalization plan for the ward that would guide her decisions, as well as input from her constituents. One area in which the two were in agreement: affordable housing. "It's absolutely vital that we make sure that hard-working families aren't priced out" of neighborhoods like Albany Park, Wanat said. The retention of existing affordable housing and the creation of additional units would be part of her revitalization plan, she said. Meegan said he would work to increase the accessibility of financing to not-for-profit developers, particularly to create more affordable housing for families. "I see the economic development coming ... and that's a good things," he said. "But we need to maintain our diversity." Competing for votes in the 35th Ward, Colon ran on his record while Rosa ran against it. "I will make sure I'm in lock step with my neighbors, not in lock step with whoever the mayor is," said Rosa, a dig at Colon's record of voting with Mayor Rahm Emanuel 96 percent of the time. Throughout his candidacy, Rosa has criticized Colon for taking contributions from developers, and Thursday's forum was no exception. Money that's been doled out to business and developers should be going to schools, he said. If elected, Rosa said he would tell developers, "Don't cut a check to my campaign, cut it to my schools." "We need leadership that's accountable to working families," he said. Colon argued that he has fought for those families, encouraging local businesses to create jobs and internships for youth, providing tenants with free access to legal rights and bringing affordable housing projects to the ward. If re-elected, he said his plans include bringing a farmers market to Albany Park and commiting Tax Increment Financing dollars to build a new Independence Park Library. Elections are scheduled for Feb. 24. In races where no candidate earns 50 percent of the votes cast, a runoff between the top two candidates will take place April 7. Thanks to your support, 70% of kids who were behind in math upon arrival at Mercy Home have improved! Get a fly new summer wardrobe — stop by our resale sho@_MercyBeaucoupup in Old Town this weekend! Don't miss out on running the #ChiMarathon this year. We have spots! Email info@mercyhomehero.com by June 16 to get in the race! 100% of our 2015 high school seniors graduated! Out shopping today for a new summer wardrobe? Stop by our @_MercyBeaucoup resale shop in Old Town! 100% of our kids graduating intend to pursue job training or college!